Introducing: Joy's New Wedding Invitation E-Cards!Introducing: Joy's New Wedding Invitation E-Cards! 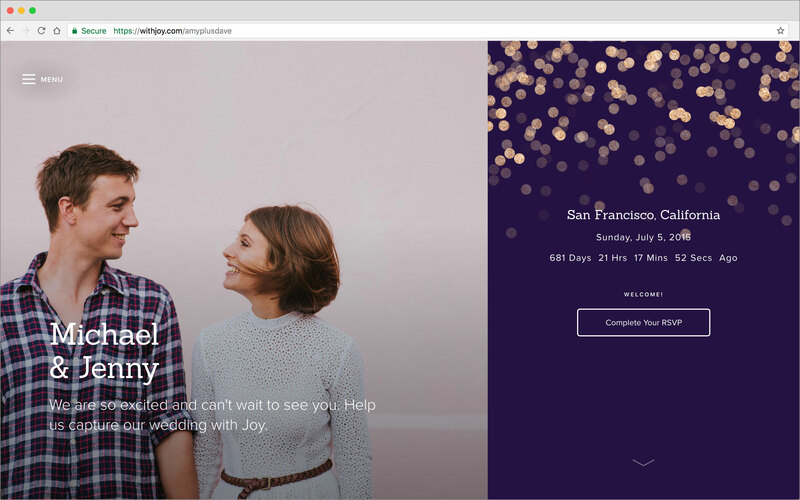 Introducing: Joy’s New Wedding Invitation E-Cards! So long, boring invite emails! Hello, brand new Wedding Invitation E-Cards! As you hopefully know by now, we take our couples’ feedback seriously. If you ask for something, we consider it. If lots of you ask for something, we build it. Today we’re happy to release our newly designed Invitation E-Cards to match your Wedding Theme! 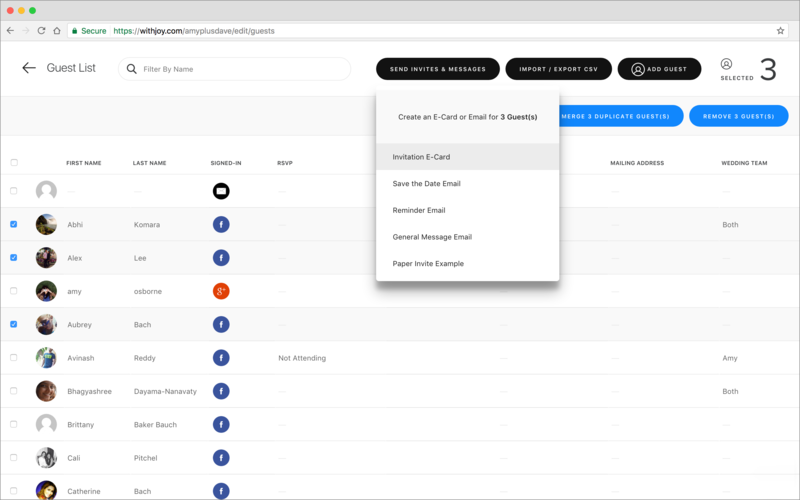 This blog post will walk you through the changes and highlight a few of the new features—including a pretty cool new magic link for your guests. Not much has changed about how you send the E-Card. You can still send the Wedding Invitation to whoever you want, whether it’s one, or some, or all of your guests. You do so by selecting your guest(s) from the list, and clicking on Send E-Cards. When you select Invitation E-Card, you’ll start to notice the differences. Do note that the General Message, the Save the Date, and the Reminder Note are still emails. This was a tough decision for us. We decided that we’d rather make progress on a better Guest Management system, +1s specifically, than redesign each E-Card. That being said, we will redesign the rest of the emails, just after we release +1s. Moving on! When you select Invitation E-Card, you’re going to see a totally new layout. There are two distinct parts to this E-Card: the email and the actual invitation. You can edit both the e-mail message and the invitation wording. 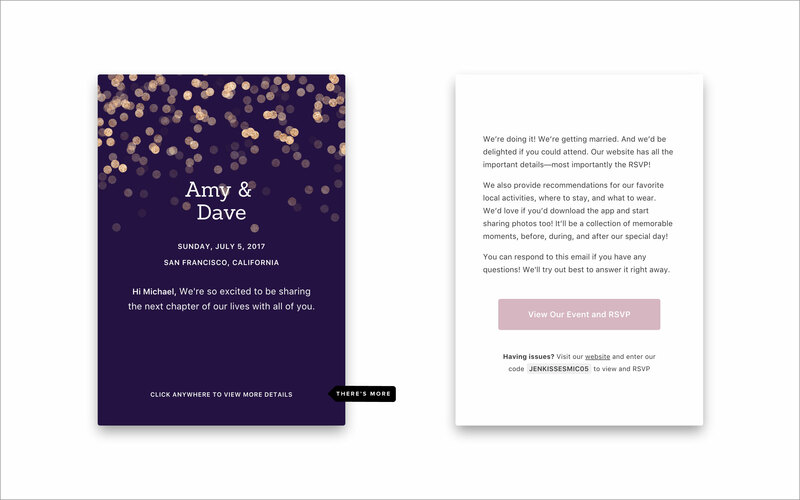 We suggest you keep the email simple, with a brief message and the link to the actual invitation, because your guests will be prompted to read more. Now for the magic part: Each email has a unique link that is specific to each guest (this is where the magic happens): “View our Invitation.” Before we introduced these new E-Cards with the magic link, when a guest unlocked a wedding or started the RSVP, the website has no idea who they were. That means they had to enter their name and email, which wasn’t always the same as the info the couples inputted (hence, duplicates in your guest list). 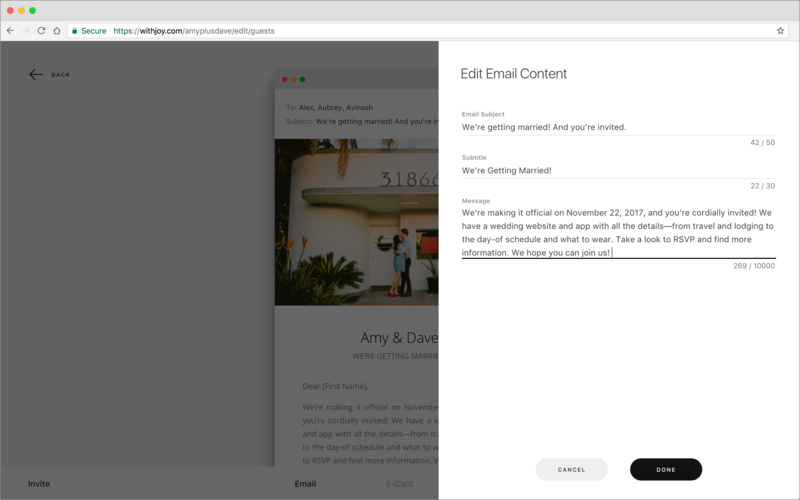 But now, when your guests click the link, it’ll automatically populate your guests’ names and emails—and if they access your site directly through the invite, they won’t need the code. Just think about how much easier this will be for Grandma and Grandpa! If you have any questions, you can email us, support@withjoy.com, or you can find us in real-time! Click on the chat icon in the bottom right corner of your website. Nice collection of wedding cards. Keep it up, guys.